You know when you get something so beautiful that you don't even want to use it; you just pure sit and stare at it [like a full on creep] for hours and hours? Well, that's exactly what happened to me last week, when Etta French sent me the most exciting #bloggermail ever. 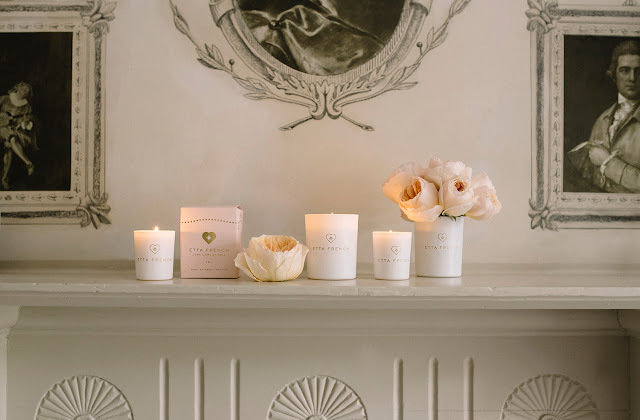 Etta French are a brand new, luxury jewellery candle company who only LAUNCHED LITERALLY THIS WEEK! The first in the UK of its kind, the Etta French jewellery candle is available in six different scents, made from 100% organic wax. It also contains a piece of designer jewellery hidden inside [which reveals itself once you burn your candle down.] Their range of jewellery candles make perfect gifts, with over 100 jewellery design discoveries - the Etta French concept itself encapsulating some of my dearest loves; perfume, jewellery and the element of surprise. "Fragrance can transport us to our happy place. It can evoke heart-warming memories, help us feel relaxed, happy and luxuriated. Jewellery can make us feel special and sentimental – it's the one treat that's top of our love list which we treasure forever. Now the two are combined in one sumptuous package. 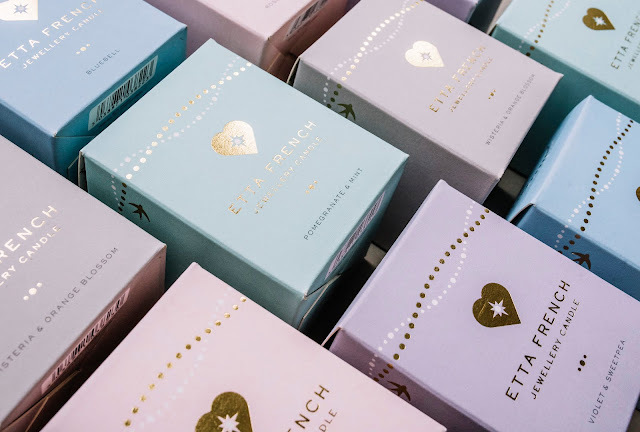 Etta French Jewellery Candles provide perfume for your home and a surprise piece of stylish, quality jewellery, hidden inside." Every candle is hand poured in the UK, using 100% natural plant wax and a blend of exquisite fragrance, to infuse your home with luxurious scent. Etta French's high quality candles are both sustainable and kind to the environment; they're free from petroleum-based paraffin wax, clean burning, long lasting, free of chemical additives and not tested on animals. "Recreate childhoods spent playing in parks and invigorating woodland walks with this fresh, delicate scent. Containing only pure Bluebell, this poignant fragrance will bring British springtime into your home at any time of the year." "Violets and sweet peas create a sweet, musky perfume to captivate the heart and transform the atmosphere with its seductive, heady scent. Uplifting, intoxicating, yet delicate; a fragrance for the modern woman." "Experience harmony in an aroma: this smooth blend combines the fine floral notes of wisteria with the soft, delicate, citrus scent of orange blossom; for a delectable fragrance that will instantly transport you to a calm, relaxed and sunny place." "An elegant, romantic fragrance combining the very best feminine and masculine perfumes: the delicate sweetness of rose petals, the subtle floral spice of saffron, and the wonderful woody earthiness of tropical grass; vetiver. A truly indulgent and special scent." "Fresh, fruity, effervescent notes of pomegranate are blended into cool mint for an uplifting, refreshing fragrance to invigorate your senses and rejuvenate your mind, body and soul." "Our limited edition candle: it's warming scent is evocative of Christmas and winter time. Light the fire, snuggle in your blanket and let this opulent blend of effervescent citrus and subtle spices help relax you." I can't lie - this candle smells and burns better than any Yankee Candle or Primark special I've had. Ever. My whole flat now smells like a fresh Spring morning and the candle itself has brought oodles of class to my bathroom; with its gorgeous, minimal packaging. There's nothing quite like burning a lux candle whilst in the bath; soaking in its beautiful fragrance whilst relaxing in mountains of bubbles. As the candle burns down, it will eventually reveal a secret silver packet; containing a surprise piece of jewellery, designed and sourced by luxury jewellers Pearl and Queenie [seriously guys, Google them - I am in LOVE!] There are over 100 different designs to collect, including dainty necklaces, pretty rings, beautiful bracelets and cute charms, made from semi-precious stones, silver and silver & gold plate. I haven't quite got to the jewellery stage with my candle yet, as it's so beautiful I could barely bring myself to burn it... But I'll definitely post again with what I get. For now, here's a cheeky photo of some of the accessories found inside the jewellery candles. There's literally not one piece that I wouldn't wear from the selection pictured below; honestly, the quality of these candles and the jewellery they contain is second-to-none. They're not some cheap gimmick; each candle oozes passion and luxury and would look right at home as part of any blogger flatlay. Etta French very kindly packed in a few extras with my jewellery candle - and I can't even cope with how good the Pomegranate and Mint candle smells. I'll definitely be placing an order for this fragrance next; I need this scent in my life! At just £37.50, each 20cl candle will fill your home with beautiful fragrance for up to 50 hours and gifts you a stylish, quality keepsake to cherish forever. I wouldn't normally pay £37.50 for a candle [as I'm a cheapskate] but in this case, I'd make an exception. The jewellery and candles themselves are amazingly good quality. Pretty much every female I know will be getting one of these for Christmas [including me!] When you look at the likes of Yankee Candle, where you pay near enough £30 for just a lone candle, it makes sense to upgrade to Etta; where you get home fragrance, relaxation vibes AND a beautiful piece of jewellery for just a smidge more coin. If you fancy getting in on the Etta French action or want to find out more, you can check out their website www.ettafrench.com or have a good stalk of their Instagram, Facebook or Twitter. FYI - Etta French's Instagram feed = all the goals. * This post contains items I was gifted for the purpose of review, but all views are my own - I wouldn't lie to you guys - it's not big and it's not clever. Plus, what's not to like? !